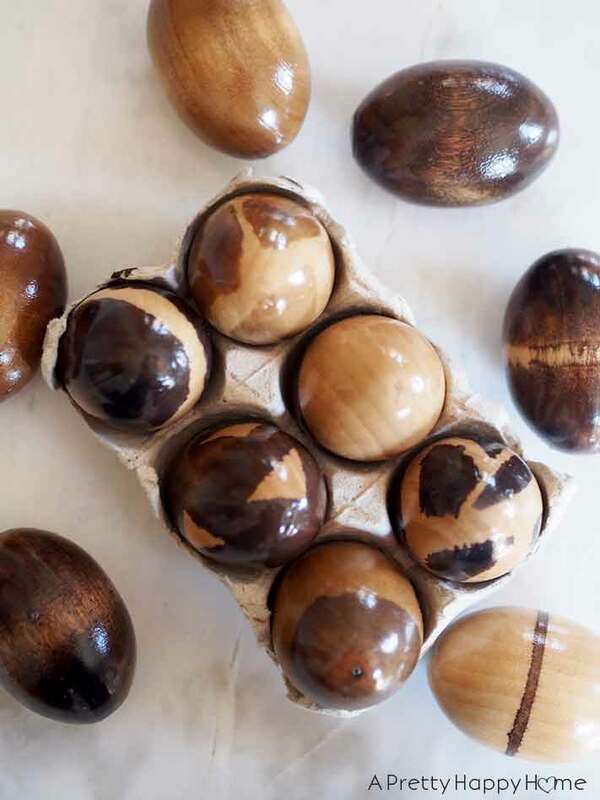 I’m on a quest to decorate faux Easter eggs that I will love so much I will want to decorate with them year after year. I’m sure there are far nobler quests out there, but since comparison is the thief of joy, let’s not compare how you are curing cancer and I’m…not. My last attempt at decorating faux Easter eggs was a comedy of errors and I still haven’t fully recovered from that episode. There was one aspect of that egg painting fiasco that I wanted to try again. Why? Because it was SO DARN SATISFYING. What was it? Dipping the eggs in polyurethane to make them shiny. It reminds me of a chocolate fountain. But instead of chocolate and strawberries it is polyurethane and wooden eggs. My version is way easier on the waistline. 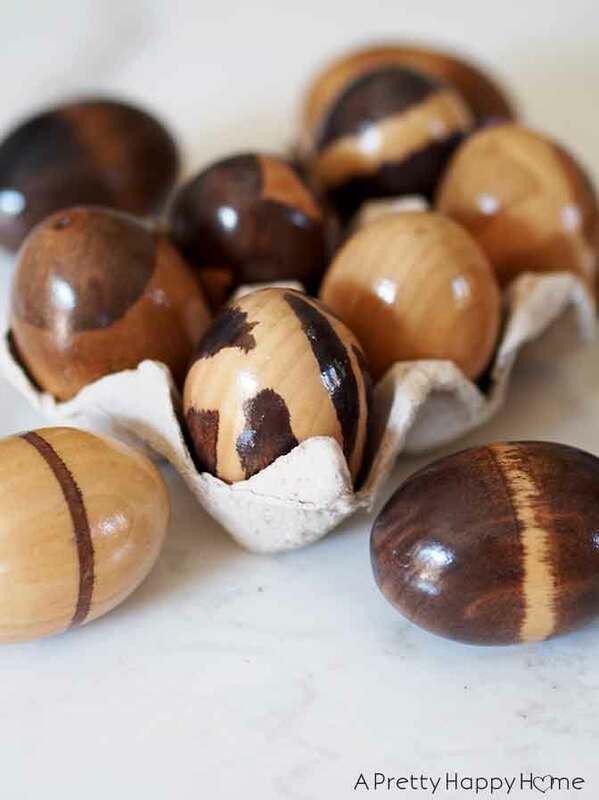 This time I decided to try decorating wooden Easter eggs. I wanted to stain them and then get to the good part – dipping them in polyurethane. 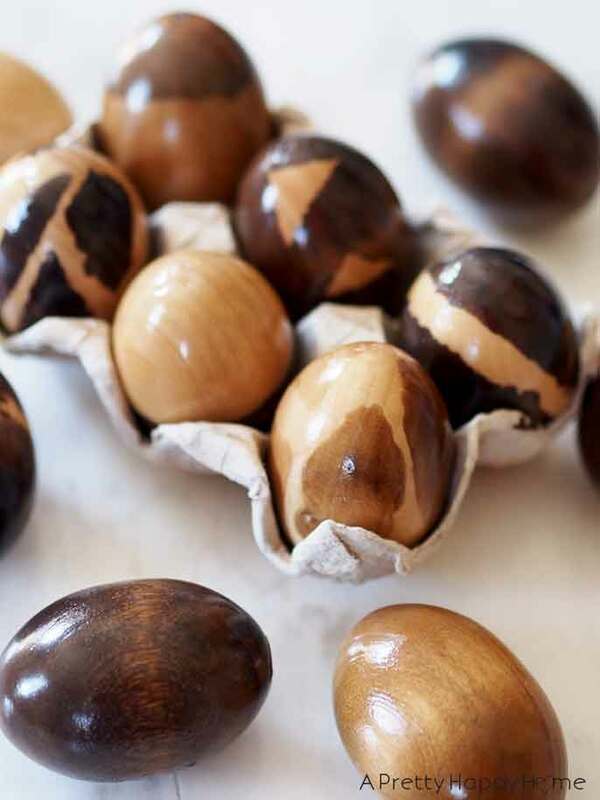 Surely staining wooden eggs should be easier than painting plastic eggs, right?! I bought 12 wooden eggs on Amazon for approximately the same price as a dozen organic real eggs. Kidding! They were a little bit more – $12.99. They are the actual size of a large chicken egg though. The eggs came more-or-less sanded. I didn’t do anything to prep them for stain besides wipe off the dust with a damp rag. This next part is optional, but I wanted some of my eggs to have patterns or color blocking, so I taped them off with FrogTape . There was no rhyme or reason to my taping methods. I just tried to create varying patterns. A word of caution about stain and tape. The stain will probably leak through the tape. If you are a perfectionist and straight lines are your jam, this might not be the technique for you. The only time I’ve ever been able to corral stain within a boundary is when I etched a line on the wood with a sharp knife to make an edge (think of it like a ditch alongside a road) AND used tape AND used a precision brush. You can read more about that technique here. I was using different colors of stain and didn’t want to deal with cleaning brushes or throwing away disposable brushes for such a small project. So, being the professional that I am not, I applied the stain to the eggs with a Q-tip and brushed off the excess with a paper towel. Because I wiped off so much of the stain, I was able to set the eggs on a paper towel to dry without messing up the stain’s finish. When the eggs were dry I peeled off the FrogTape and readied myself for the fun part! I wanted the wooden Easter eggs to be shiny, so I needed to cover them in polyurethane. I could have sprayed the eggs. I also could have brushed on the polyurethane. Either of those techniques is fine. But I guarantee you it isn’t as satisfying as dipping the eggs in a can of polyurethane! Don’t knock it until you try it! Plus, this technique results in a perfectly smooth finish. As you can see from the pictures, to dry the eggs, I stuck a pushpin or thumbtack with a ribbon tied to it in the end of the egg. You just need the pushpin to go far enough into the egg that it will hold the egg while it is drying. It’s best if the plastic part of the pushpin does not touch the egg. Then I hung the eggs to dry from a dowel that was propped up on two cans of paint. A broom handle would work too. I used a plastic tablecloth from the Dollar Store as a drop cloth to catch all the drips. The pushpin is going to leave a small hole in the egg, so emotionally prepare yourself to either accept this reality or to fill in the hole. I’m an acceptor. 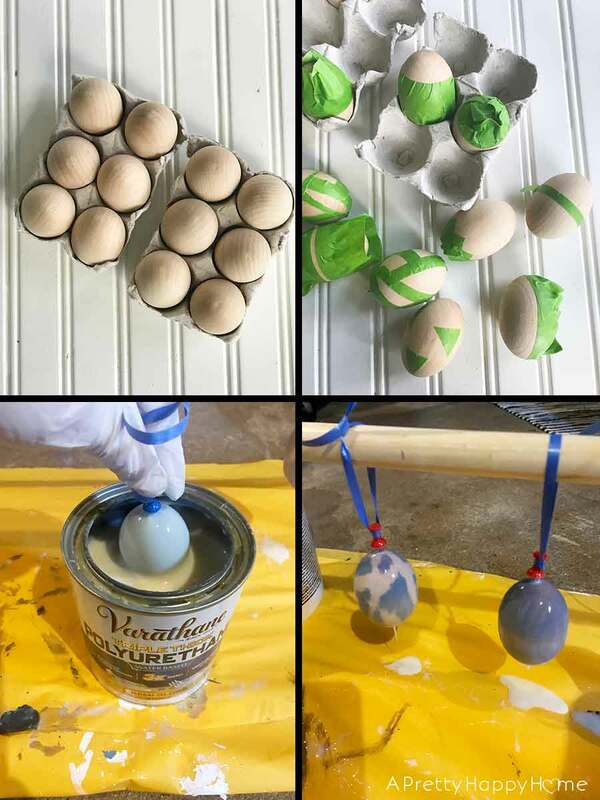 From my previous experience with painting eggs, I knew that one drip of the polyurethane was going to dry on the end of the egg and create an unsightly dilemma. To eliminate this problem, I used a brush to lightly whisk away that last drip. The success of this technique had to do with my timing of going back to check on the eggs every 5-10 minutes until they were done dripping. If I didn’t like how that last drip dried, which was on about half of my eggs, then I lightly hand sanded it down with 220-grit sandpaper . This will make a cloudy mark on the finish of the egg since you are scuffing up the polyurethane. Don’t fret! This can be fixed! I used a small artist’s paintbrush to touch up those areas with more polyurethane and it fixed that cloudy problem. Then it was time to do my happy dance. Yes, it was an actual dance. Yes, it was as awkward as you are imagining. But I have no shame in this game because I had a variety of reasons to celebrate. First, this was a relatively drama-free project for me. Compared to my last egg painting adventure, this one was a cake walk! I felt semi-professional toiling away in my sweatpants in my unfinished basement. Second, I don’t always get giddy about my projects, but I’m making an exception for these eggs. I thought the way the stain bled under the tape might bother me, but it doesn’t! That bleed gave the eggs a bit of a safari feel, which I’m really into right now. I think I could get away with displaying these eggs long past Easter without people wondering why I still have Easter decor out. Last, since the eggs are wood, I can also sand them down and start over if I decide I want something different. You know how much I love projects that can be restyled or repurposed! Everything is fair game for a makeover around here! Thanks for hanging out with me today. Here are some other stain projects that you might enjoy!